President Trump no longer tweets regularly about new record highs for US financial markets. The tweets were a core activity in the first year of his Presidency, when he was still feeling his way into the job. This programme is quite different from the historical Republican platform focused on free trade and sound money. The comparison between President Reagan’s 1986 tax reform and Trump’s tax cut last year highlights the different agenda. Reagan built consensus over 3 years, and ensured his reform was revenue neutral. Trump simply used the Republican majority to force through the tax cut, and ignored warnings that it could add $1tn+ to the deficit. 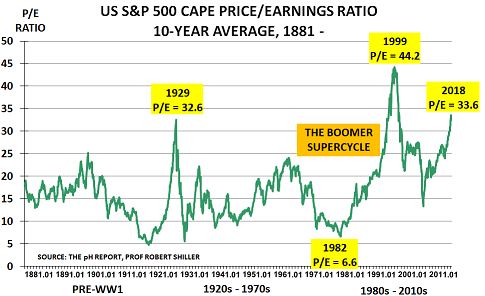 Wall Street has had a great run, as the chart of Prof Robert Shiller’s CAPE Index confirms. Its Price/Earnings ratio peaked in January at 33.6 – even higher than 1929’s top of 32.6. Only the dot-com bubble at the end of the Boomer SuperCycle was higher, at 44.2. The key issue is the growing doubt over the outlook for the super-hot tech sector, and the FAANG tech stocks. This challenges the 4th “Everyone” – that “Everyone agrees” Facebook, Apple, Amazon, Netflix, Google (and Chinese companies such as Alibaba and Tencent), will dominate the global economy for decades ahead. 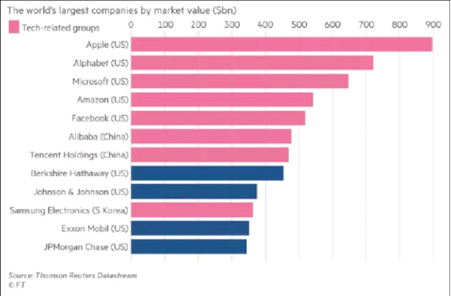 Last year, as the Financial Times chart confirms, the world’s Top 7 companies by market value were all tech-based. But what if this idea is wrong? 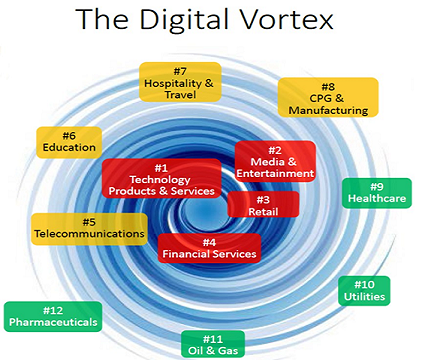 Can tech really continue to grow to the sky, or are its markets starting to mature? Can Apple and its rivals continue to increase their earnings, given these challenges? Similarly, the growing political storm over Facebook suggests its days of stellar revenue and profit growth are ending. Questions are also being raised about the viability of tech’s business model, which depends on users giving up their personal information for free. After all, history shows that even the highest-flying companies and markets eventually mature. At that point, Price/ Earnings ratios begin to drop, and investors start to refocus on dividend payments instead. Unfortunately for Wall Street, it seems that Trump’s attack on free trade may turn out to be the catalyst for their discovery that tech’s days of exponential growth are over. Trade wars are not normally good for business. Nor is political uncertainty – which is certain to rise as President Trump energises core voters ahead of the mid-terms. His Gettysburg policies set out, after all, “to protect American workers“. If Trump’s initial focus on financial markets was indeed purely tactical, markets now have a bumpy ride ahead. The risk is that gradually, a 5th “Everyone” will become apparent – that “Everyone realises” markets have peaked. The post Trump’s trade war hits Wall Street as tech downturn begins appeared first on Chemicals & The Economy. The average smartphone now has “more computing power than the computers used during the Apollo era to put the first men on the moon.“ The question facing all of us, is “How will this power be used to disrupt our current business? The key issue is the need to make the connection between our own behaviour in our personal lives, and what this means for our businesses. There is no rule that says new companies will succeed at the expense of existing companies. It is all a question of mindset – does everyone in your company still assume that tomorrow will always be the same as yesterday? Or are they already developing the new business models that will be needed for future success? The encouraging aspect of the coming transition is that we already know the broad outline of how it will develop. In manufacturing, for example, the arrival of 3D printing is going to lead to a revolution in supply chains as production takes place close to the end-user. Big money is already being spent on turning this concept into reality – only this week, US firm GE paid $1.4bn for 2 European start-ups in the 3D printing for aerospace market. Car repairs are an obvious opportunity. If you have an accident, and need a replacement part, your local garage will be able to download the design and print it for you, whilst you have a cup of coffee. There’ll be no need to wait for it to come from the manufacturer. This model is already operating in the aircraft industry, as I highlighted last year.